MOL Group carving niche in sharing economy. Hungary-based MOL Group is a regional market leader in refining and fuel retailing. The integrated oil and gas company’s assets in Central and Eastern Europe (CEE) include 20.9 million tons per year (nearly 420,000 barrels per day) of processing capacity at four refineries and nearly 2,000 service stations in 10 countries. MOL recently added a new dimension to its business by launching a car-sharing service. Moreover, one-third of the 300-strong fleet of Volkswagen up! model cars that the company owns and operates in its “MOL Limo” venture runs on electricity. Furthermore, MOL aspires to own and operate a fully electric car-sharing fleet as the business develops. 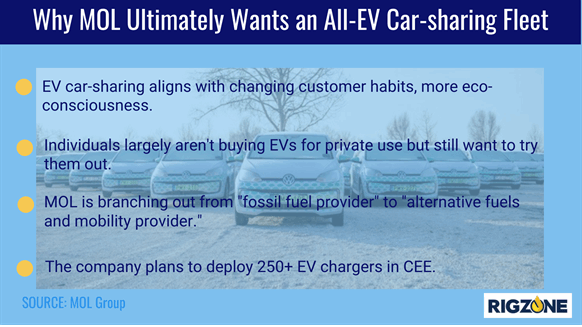 Given MOL’s deep roots in refining and fuel retail, why go into car-sharing using vehicles that – if all goes according to plan – will ultimately run on neither gasoline nor diesel? Rigzone: What’s influenced MOL to get into car-sharing? Ratatics: The global mobility services market is expected to increase by 50 times in 15 years. Significantly, car-sharing has produced double-digit growth in recent years so the potential is huge. We believe that changes in consumer patterns such as the decreasing importance of car ownership – especially among Millennials – along with increasing environmental consciousness will result in further increasing demand for our car-sharing services. To own a private car annually costs around EUR 6,500 yet, ironically, it is not used for 95 percent of the time. Our customers are starting to recognize this fact. Rising urbanization, which is linked to growing environmental concerns, are important factors as they are prompting many cities in Europe to impose stricter regulations related to car traffic in the city centers. They do not only restrict the usage of cars in the most congested areas, but actually further increase the cost of owning a vehicle due to, for example, stringent parking rules and in some cases even taxing the owners. This is not happening in our region yet, but the global trend is clear. Rigzone: Are other refiners in the car-sharing business? If so, what is MOL doing differently? Ratatics: We are aware that there are some refiners that also invested in this business, but I think we are really breaking ground as we are the owners of the vehicles – through our fleet management subsidiary – as well as the operators of the service. And, of course, we are operating an electric fleet and that’s different. At this stage we still have some traditional cars in the fleet, but in a couple of years as we progress with the deployment of the EV charging infrastructure we’ll have a fully electric fleet. Rigzone: How will you know that your car-sharing initiative is a success? Ratatics: We are so pleased that the new service has already met with a great reception from the customers. We’ve had 15,000 registrations over the first two weeks, which exceeded our expectations. As with all our investments we expect financial returns, but this one is a little different. Mobility is for us not an immediate cash generation opportunity, but it has a huge long-term potential. By 2030 a third of driven kilometers are expected to come from car-sharing so the future looks promising. At MOL we believe that the mobility market will be more about selling kilometers than liters of fuel; however, it is still closely related to our core business. We are a trusted brand in our region with a strong reputation for fuel sales. Once we are able to connect the MOL brand and shared cars in customers’ minds – for example, by building on the reputation of our existing bike-sharing scheme MOL Bubi – we will be able to achieve real competitive advantages in mobility services as well.